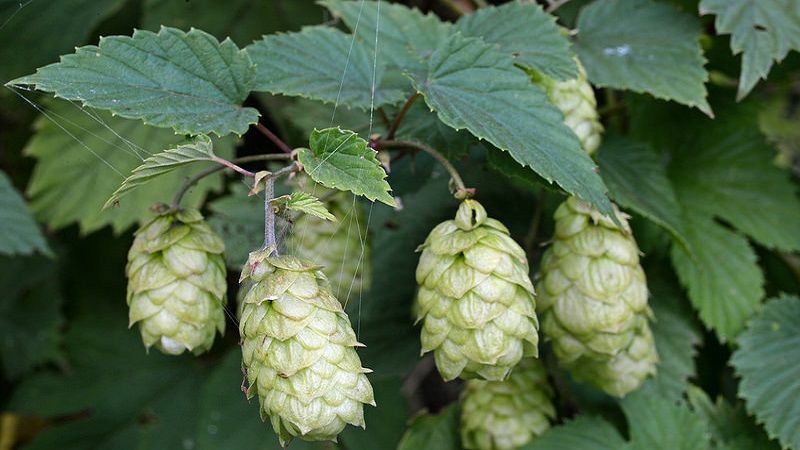 Humulus Lupulus (Common Hop) is widely used in the beer industry, but a few people are aware of its medicinal goodness. They are used as a remedy for bacterial and fungal infections, stress and depression and sleeping disorders. Besides this, Humulus Lupulus is beneficial for individuals with diabetes, high cholesterol levels and for those who want to lose weight. The presence of health-promoting chemicals and bitter acids in Humulus Lupulus makes it a valuable medicinal plant. Scientific studies have revealed that high doses of Humulus Lupulus enhance anti-anxiety and anti-stress effects. Such an effect is possible due to the presence of flavonoids in it. Flavonoids and flavones possess anxiolytic property. These compounds modulate and enhance GABA, a brain chemical that improves mood and relieves stress. Furthermore, α-bitter acids and β-bitter acids are active components present in Humulus Lupulus responsible for its antidepressant and anxiolytic effect. Humulus Lupulus has been traditionally used as a sleeping aid. It is a sedative plant that fights insomnia and induces sleep. Humulus Lupulus increases the activity of GABA which in turn helps a person to relax. Humulus Lupulus is effective in reducing symptoms of menopause. It was observed that treatment with Humulus Lupulus reduced severity and frequency of hot flushes, sweating, palpitation, and insomnia. Isohumulones are plant chemicals present in Humulus Lupulus that promote good health. Scientific research has observed various benefits of isohumulones in the management of diabetes mellitus and insulin resistance. A study demonstrated that 8 weeks of treatment with isohumulones lowered fasting blood glucose levels and HbA1c which was otherwise high in diabetics. Iso-alpha acid, an active natural compound present in Humulus Lupulus influences uptake of glucose by the cells for energy. This lowered the presence of glucose in the bloodstream. High level of cholesterol increases the risk of heart diseases and stroke. Evidence-based studies have revealed that treatment with Humulus Lupulus reduces the level of LDL (bad) cholesterol and total cholesterol. An increase in HDL (good) cholesterol was observed which in turn is correlated with reduced risk of heart diseases. Xanthohumol, a natural compound present in Humulus Lupulus inhibits CETP, a protein that increases the risk of heart diseases in individuals with high cholesterol levels. Such an inhibition is further associated with reduced cholesterol accumulation in the arteries, improved lipid levels, and a healthy heart. Humulus Lupulus is an amazing anti-obesity agent. It inhibits weight gain and it might be a useful agent for preventing obesity. Isohumulones increase resting energy expenditure, reduce accumulation of fat and promote the breakdown of fat. Thus, fat is not stored in the body and is used as a source of energy. Extract of Humulus Lupulus has a strong anti-bacterial potential. It fights against various gram-positive and gram-negative bacteria and thus, it can be used for the treatment of various infections. The antibacterial effect of Humulus Lupulus was reported against E. coli and Bacillus subtilis. These bacteria are responsible for diarrhea and food poisoning. Thus, Humulus Lupulus protects against these infections.